We're almost one month into Summer, and the weather as been everything but Summery. We had three days of sun, and of course, I decided to take the next few days off and we're back to cloudy skies. Lately, I've been giving a lot of love to Chanel's Rouge Allure in 152 Insaisissable, and here's a look of me wearing Insaisissable on a casual outing. I took this photo well-over five months ago, and trust me, it no longer looks this way. Are you are much of a sucker for pattern designs on products as I am? I'm like a "hungry hippo," gobbling them up at the beauty counters. I don't mean to sound like an ingrate because I do like the Jardin de Chanel Blush Camelia Rose Blusher. However, as precious as the two-tone Camellia Rose design is, and as pretty as the warm,muted rosy-pink flush is, I must be frank, the shade isn't terribly unique. 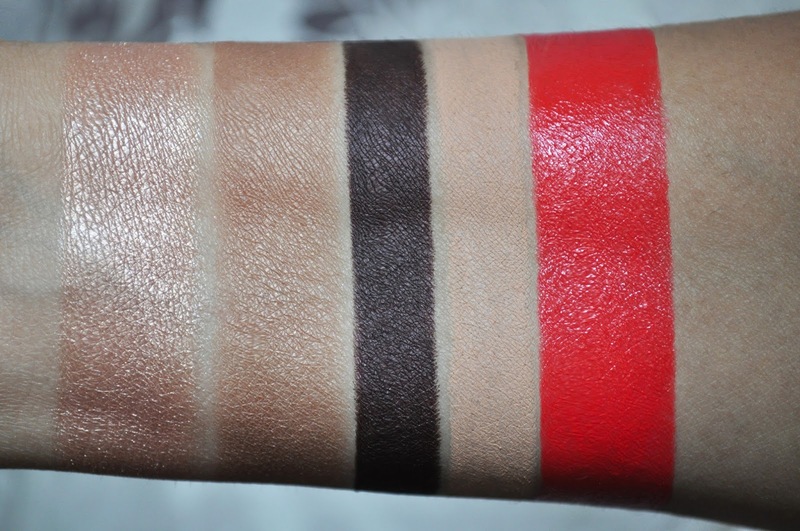 From left to right: 82 Emerveille Illusion d' Ombre, 417 Beige Lame Ombre Essentielle Soft Touch Eyeshadow, 62 Ambre Le Crayon Khol, 69 Clair Le Crayon Khol, 152 Insaisissable Rouge Allure. 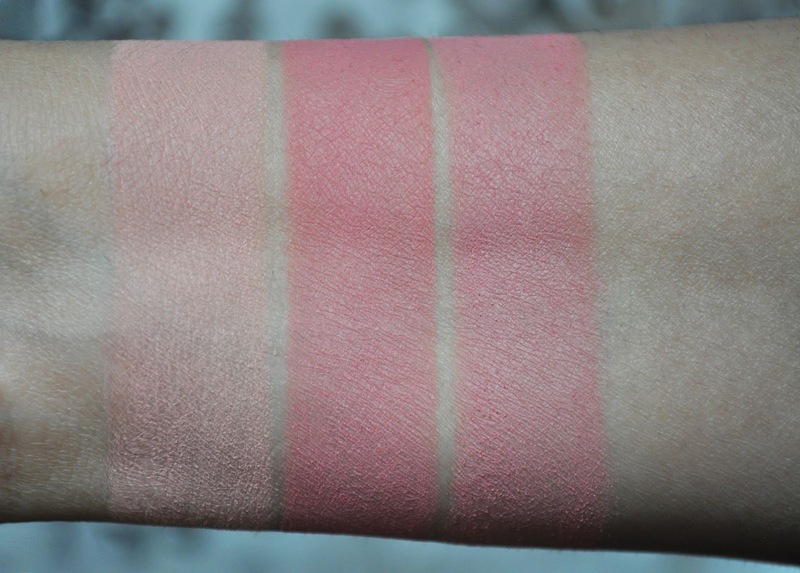 Jardin de Chanel Blush Camelia Rose swatched individually, third swatch is the two shades combined. Chanel Soleil Tan De Chanel Sheer Illuminating Fluid Sunkissed (applied under foundation and to highlight). Nars Sheer Glow Foundation in Medium 3 (Stromboli) switched to my Summer shade. Chanel Soleil Tan De Chanel Luminous Bronzing Powder in 907 Sable Beige. 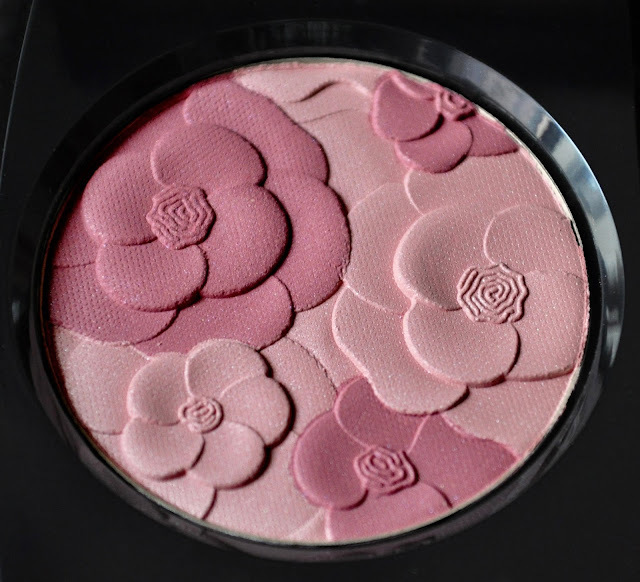 Chanel Jardin de Chanel Blush Camelia Rose . Shu Uemura Hard Formula Eyebrow Pencil in 02 Seal Brown. 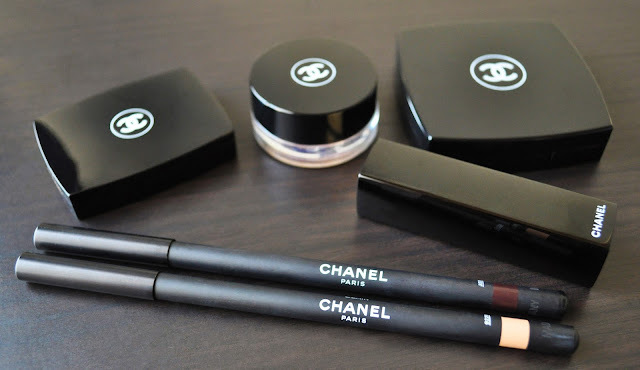 Chanel Le Crayon Khol in 69 Clair (used to shade the brows and highlight the brow bone). Clinique Chubby Stick Shadow Tint For Eyes in 04 Ample Amber (on the lid and blended into the crease). Chanel Ombre Essentielle Soft Touch Eyeshadow in 417 Beige Lame (applied over 04 Ample Amber). Chanel Illusion d' Ombre in 82 Emerveille (patted over the center of the lid and lower lash line). Chanel Le Crayon Khol in 62 Ambre (used to tightline and winged-out on the upper lash line). Chanel Rouge Allure in 152 Insaisissable. This is a beautiful classic look you created. So pretty! 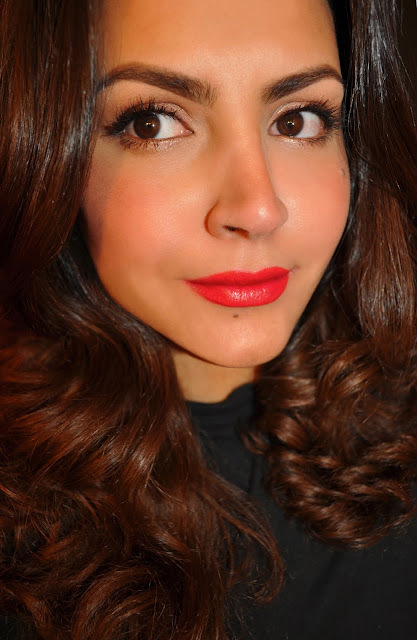 Love pairing shimmery neutral eyes with red lips. I think this year summer came quite late. I'm pretty sure it will be scorching in September. Hey Lena, I thank a lot of time (and a steady hand) to do these swatches. I really loved wearing this look, Insaisissable is a lovely coral-tomato-red. Did you pick it up? We've had the heat and humidity, but none of the sunshine. Slowly, but surely the sun is starting to peek through. I wish I could capture swatches like this! I have the hardest time photographing them. This look is stunning!! I am a sucker for a pretty design and I don't have this Chanel blush, I did get the Chanel Lumiere d’Ete Illuminating Powder. Good thing I love the powder though regardless of the design . I really don't do anything special with my swatches, just a steady hand and patience. Normally, I change my look everyday, but I have worn this one a few times last week. I purchased the Lumiere d’Ete Illuminating Powder as well (I'm actually wearing it right now), and I love it.